The current season of anime has left us with many eye-catching opening and ending sequences. Now that right about every TV series seems to have shown what they’ve got to offer, let’s examine the most striking examples and the teams behind them – which can be rather small, since in multiple cases these sequences were produced almost entirely by single individuals! The last season of anime wrapped up with one last gift: a special opening attached to the finale-but-not-quite of Persona 5 The Animation, brought to us by its series director Masashi Ishihama. Even by his high standards, it was an outstanding piece of work, once again confirming that he’s among the absolute best OP/ED directors – especially if we only take into account those who are currently active. It’s always nice to see those specialists in this field put together new sequences that prove that they’ve earned their position and deserve to be in such high demand by industry folks. At the same time, I’ve got to admit that I’m quite happy that this fall season’s managed to concentrate so many neat sequences without resorting to the usual experts; not only does it prove that there are actually way more individuals and teams capable of creating memorable offerings, it also means we’re likely to get even more striking ones when those specialists return in later seasons. The opening and ending aces are taking a break (or rather, preparing future works, as there are no breaks in anime) and that’s actually a good thing! Well, all aces but one. The exception to the norm is Ryouma Ebata… who honestly shouldn’t be in this list, especially not twice. As the character designer and one of the chief animation directors for That Time I Got Reincarnated as a Slime, there’s more than enough work on his plate already. However, like all his fans know, Ebata’s got a knack for sequences he crafts essentially by himself, so he put aside enough time to animate both his own intro and outro. The result is as unsurprising as it’s downright cool. There’s no denying that Ebata’s sequences are formulaic, from the general ideas to more specific quirks, but if it ain’t broken, don’t fix it. His action remains extraordinarily readable because of his clean motion arcs, which allows him to bypass the clarity issues that fast action bursts in openings tend to suffer from. His understanding of body movement comes across in less flashy but equally impressive ways, like the protagonist regaining their balance after some pirouettes. And while he hasn’t had as much of a chance to draw effects within the series itself, as there are other specialists handling that aspect, he also got to show off his sharp FX. A good reminder that while he definitely has an iterative style as director and storyboarder, Ebata is a very complete animator who can handle all the ideas he comes up with. The ending is a more restrained affair, as they tend to be, but once again showcases Ebata’s exceptional understanding of body motion. Though his animation isn’t chained by realism, the gesture work is as authentic as it gets, hence why he goes to great lengths to show the protagonist regaining their balance after morphing, before launching themselves forward again. The most famous encapsulation of his style is the so-called Ebata Walk, which of course makes its appearance in this sequence; Ebata takes shoulder movement, the swaying with each step you’d notice in real life… and exaggerates them to an extreme degree, so as to make them appealing in animation form. The enchanting rhythm of his resulting work never fails to catch the attention of viewers, no matter how commonplace the gestures are. And beyond all the technical goodness, I’ve got to say that I appreciate the way Ebata linked both sequences – something that’s technically possible to do in normal productions, but that’s much easier to coordinate when you’ve got the same key staff member fully in charge of both. The sense of continuity with the shared settings is neat, but my favorite’s got to be the very last cut of the ending leading to the first one in the opening. When the opening first aired on TV and before the end credits rolled to give the answer, plenty of fans thought that this was the work of Sayo Yamamoto. And while now we know that’s not actually the case, it was a fair assumption! The combination of horror, pop and urban aesthetics, the contrast between reds and blacks, and even the ability to derive something that in no way resembles the actual content of the series and yet captures its spirit are all elements that have defined her openings for years. What fans did immediately predict, though, is something that explains the real link between her and what we’re seeing here: the presence of Sunghoo Park, who acted as director, storyboarder, supervisor, and also the main key animator. Park’s been collaborating on and off with her MAPPA projects, so it’s no big surprise that he’s embraced many of her quirks. Mystery easily solved! But it would be a mistake to look at that opening simply as Park doing a satisfying Yamamoto impression. After all, what’s most interesting about it is how he managed to twist her ideas into something that fits his own identity. The opening summarizes many of his charms: Park is an exceptional Kanada-style animator with very satisfying breakneck timing, plus a knack for block shading. He’s personally quite fond of superhero stuff too, which made the sentai scene a great outlet for his love. He combined what he’s learned from talented peers with all these points that define his artistic personality and even managed to present that diverse spectacle in cohesive fashion, as if his own passion for every element acted as the glue keeping it all together. Park hadn’t had much luck when it came to his previous openings – Blade & Soul was hardly a good opportunity, and his almost solo sequence for Space Battleship Tiramisu still managed to get screwed in the few steps that weren’t on his hands – but with this one, he’s presenting his candidature to become another name to look out for in this field. After two action-packed offerings, let’s calm down with a personal favorite of mine. Bloom Into You‘s opening serves as a great argument as to why series directors can be the perfect choice to handle the intro to their own shows. Sure, relying on creators who specialize in sequences like these increases your chances to have what’s essentially a neat music video, but there’s a special charm that comes from being able to project the characters’ personality onto the screen in a meaningful way. And who’s likely to be able to do that? The same person who’s got to worry about the inner workings of their minds throughout the entire show, of course. Makoto Kato built a consistent visual vocabulary that captures the characters’ feelings (especially in the episodes he storyboards himself), and that’s present all over this opening; the water motif he uses to represent Yuu’s anxiety, submerged in a society where the feelings she can’t grasp are considered the norm, is just as evocative as the withered flowers (with precise readings) that follow Touko for reasons that fans of the title will understand. Bloom Into You‘s opening is a beautiful sequence that takes on a whole new meaning if you’re acquainted with the characters and their struggles, so if it’s made you curious, you know what to do. Some of you might be thinking that this is cheating, that even though this new opening corresponds to the start of Fall TV anime, Boruto isn’t a seasonal series and thus doesn’t really fit this format. To which I’d reply yeah maybe, but isn’t it damn cool? Though it features some of the Pierrot-affiliated stars from the show’s production – ace Chengxi Huang, Masayuki Kouda, Tatsuya Koyanagi – the opening was for the most part in the hands of the company that actually produced it: Studio Colorido’s new Team Yamahitsuji. Spearheading this initiative we find Tatsuro Kawano, who directed and storyboarded the opening. Though this is his first time, the sequence might feel oddly familiar to some of you; the intertwining of very intimate character scenes that present the vulnerabilities of the characters but also their warmth with grand scale action, even the digital techniques to present the animation appear to be something you’ve seen in the past – because you have! Kawano is proudly following in Shingo Yamashita‘s directorial footsteps, and his mentor actually made an appearance to handle the composite of the sequence. Photography artists rarely manage to make the difference by themselves, but Yama‘s ability to draw the best out of everyone’s personal styles made this opening all the much better. We’re in an era where the way animation is conveyed is just as important as the technical qualities the drawings had, so people like him are sorely needed. And yes, it goes without saying but making your grand debut with some Norio Matsumoto animation is as lucky as you can get in the world of anime. For our last main feature, we could have chosen the soothing, satisfying jogging in Run with the Wind‘s ending sequence. Hideki Takahashi’s animation in particular is characterful even in very long shots, and there’s something captivating about the way he makes bodies move. 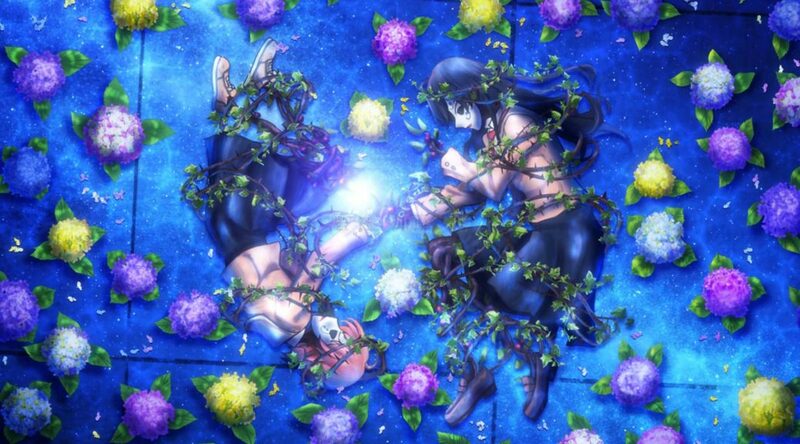 So instead let’s ignore all of that and talk about a very different athletic effort: the ending for UzaMaid!, a title that many people have understandably decided to ignore. But leaving the sins of the show itself aside, this sequence is a beautiful exercise in economy: simple, relatively loose drawings in fairly short loops that still come across as solid bodies with volume, with excellent expression work as well. This all – and I do mean all, minus some supervision by the character designer and the finishing touches – comes at the hand of Yusuke “nara” Yamamoto (not to be confused with Yama no Susume‘s director with the same common name), one of the most talented young animators currently hanging out at Dogakobo. The studio lost some of its ability to gather exceptional youngsters with the departure of Shouta Umehara to A-1 Pictures/CloverWorks, but they keep the same mindset that allows up-and-coming figures to receive real opportunities to showcase their skill. And even if this show puts you off intensely, that is a good thing! Choosing just a handful of sequences was troublesome, which is a good sign for the season as a whole. Shows that we’re covering on the regular like Gridman and Tsurune have beautiful sequences (especially the very personal closures crafted by a small group of people, a trait both of them share) but this time we wanted to highlight new stuff, so we passed on them. Yasuhiro Kimura‘s opening for Jojo, an evolution of the aesthetic he presented in his first teaser with striking bursts of animation, just barely missed the mark. Both opening and character–focused endings for Rascal Does Not Dream of Bunny Girl Senpai are nice showcases of character animation that bravely fight against the bland design work, whereas RELEASE THE SPYCE‘s sequences are all about the aesthetic. Black Clover took its sweet time to properly finish its new opening, but the final version stands as exhibit one million of Tatsuya Yoshihara and his brave young army doing the absolute best they can out of a poor situation. Even Karakuri‘s ending earned a nod – 10GAUGE‘s editing work is so gorgeous that they make you wonder if OP/ED even need new animation at all. So, what’s your favorite sequence this season? I should have dropped a mention to Pokemon’s too, it has multiple cuts I love even if it doesn’t fully click as a sequence to me – similar to the new One Piece one, which has those incredible Kojima & soty parts. Not a single mention of Alicization’s OP and ED throughout the entire post? Is this an out of season April Fool’s joke? Just to metion, Irozuku Sekai no Ashita kara backgrounds in both opening and ending are really beatiful.